The University of Oregon is a multi-billion dollar contributor to the state economy that planted a $2.3 billion footprint on Oregon’s fiscal landscape last year, according to a new study by UO economics professor Tim Duy. Perhaps more importantly, $1.3 billion of that was new economic activity that wouldn’t have happened without the UO. Duy’s study is one of the first to track this important metric separately from overall economic impact. 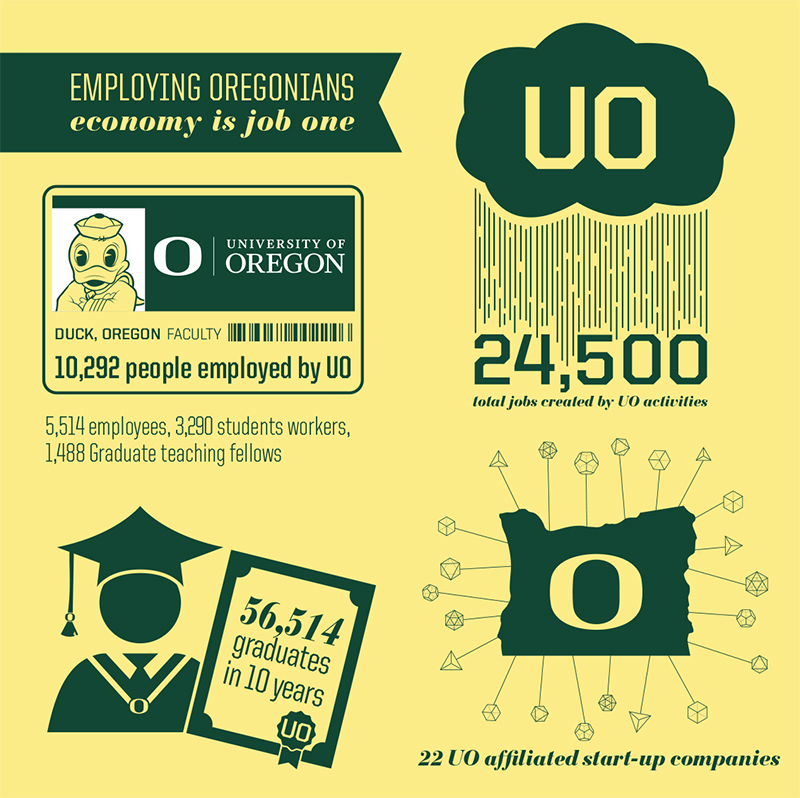 The UO boosts the prosperity of Oregonians through its employment and spending, in addition to its primary role of educating Oregonians and fostering research that creates innovation and new businesses. The report shows the university creates four major drivers of new economic benefit: university spending, student spending, visitor spending and construction. 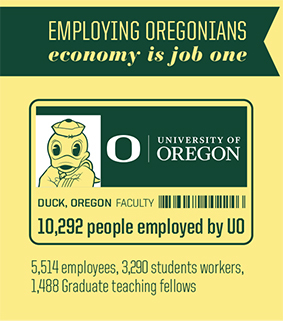 In jobs alone, the UO makes a significant contribution. 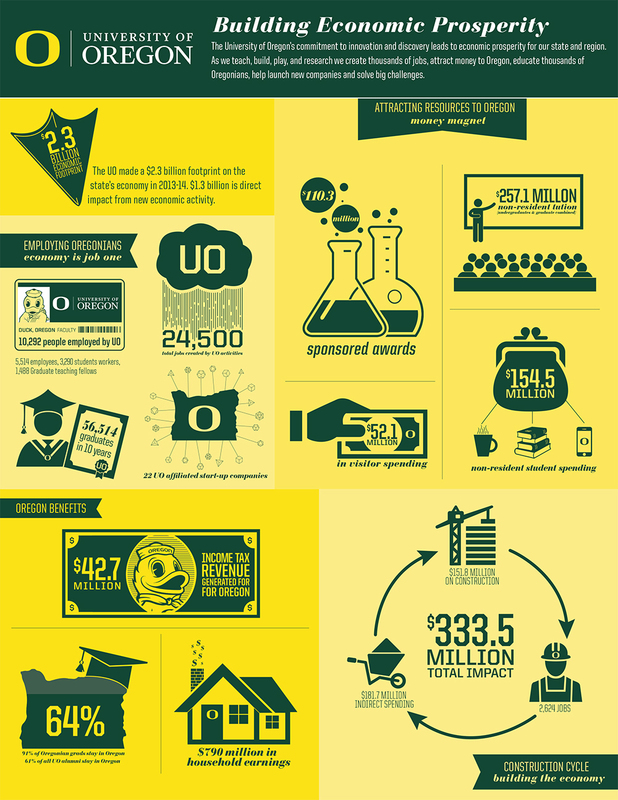 In 2013-14, direct and indirect spending by the university supported more than 24,500 jobs in Oregon. Of those, 8,500 were jobs created as a result of dollars attracted from outside the state. 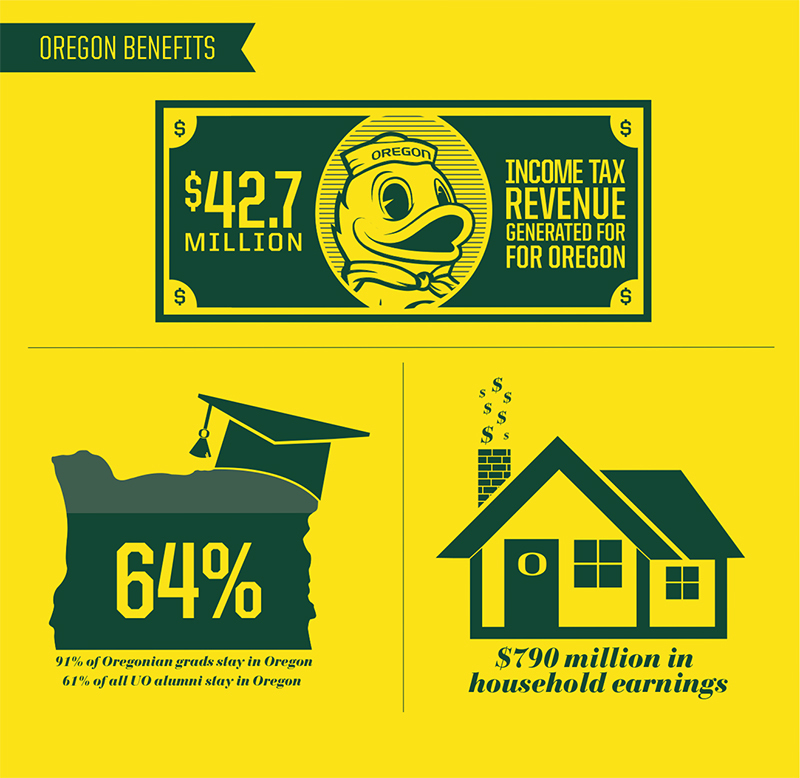 Additionally, the household earnings generated from the UO’s payroll and spending contributed an estimated $42.7 million in tax revenue to the state. That amount is close to the support the institution received from the state's general fund to pay for operations. The UO’s "economic footprint," or the total amount of spending associated with the university, grew by 16.5 percent over the prior year. However, Duy cautions against year-over-year comparisons because something like a large construction project can cause large variations in the results. Duy’s new approach to economic impact analysis highlights the role of the UO as a component of the state’s "traded sector," which is made up of institutions and businesses that bring in spending from outside the state. Traditional economic impact reports often fail to differentiate between the overall spending attributable to an institution — what Duy calls its economic footprint — and the new activity that comes from elsewhere and is a direct result of the university alone, which Duy calls economic impact. Spending generated by a university that circulates within a state certainly shapes — or leaves a footprint on — the economy, but some of it is spending that would have happened even if the particular university didn’t exist. In contrast, the traded sector creates spending that wouldn’t happen without the power of an institution’s economic reach beyond the state’s borders. Take spending by visitors, for example. People who come to the UO from out of state for athletic events, performances or tours by prospective students and their families most likely wouldn’t have come to Oregon if the UO didn’t exist as a destination, so their spending is new activity generated by the university. In-state residents, on the other hand, most likely would have spent that money at other schools or on other events if there was no UO, so their spending is not new activity. “I describe some of (a university’s) economic activity as a rearranging of the deck chairs. We want to be able to measure real, new impact rather than spending that’s just been shifted around,” Duy said. Duy hopes that the new approach will provide greater accuracy and consistency in estimating the economic impact of universities nationwide. Methods currently used by different states and institutions tend to be inconsistent and often opaque, making it difficult if not impossible to make meaningful comparisons. Traditional studies also may hide some common errors, such as double-counting some spending and overestimating multiplier effects. Duy’s approach aligns with best practice recommendations from the Association of Public and Land-grant Universities and the Association of American Universities, which grew out of a conference Duy attended in 2013. Duy said he will continue to look for methods that improve the quality of the information. 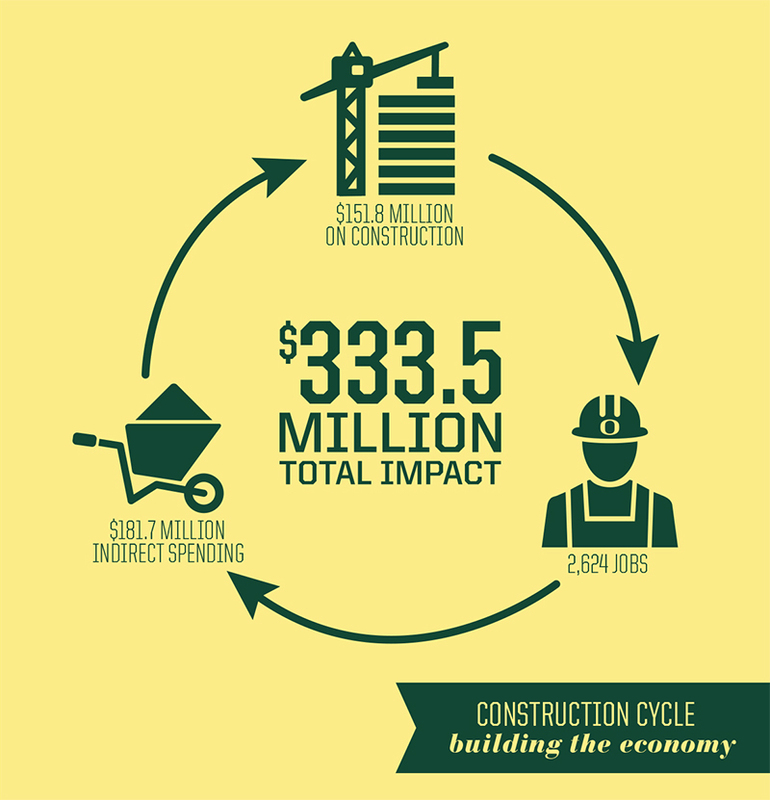 “The economic impact report is an ongoing research project. We should expect it to evolve as any other project within a research institution,” he said. 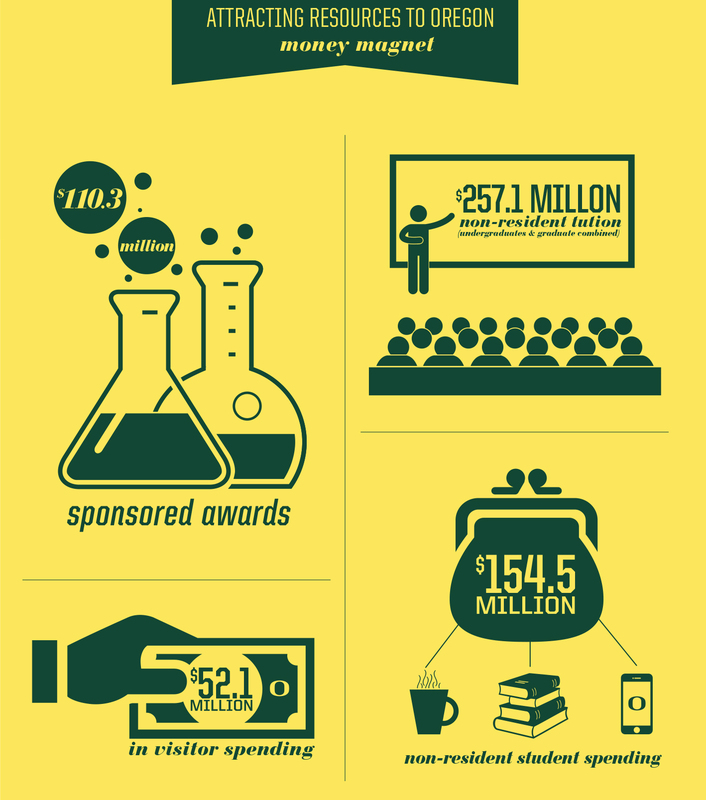 Duy’s economic impact report is one of several tools the university uses to measure the UO’s contributions to state and regional economies. He also produces the monthly UO Index of Economic Indicators, which tracks state and regional prosperity.